ALL NEW! 100% Pure PredatorPee® 64 oz. Mountain Lion Urine Growler Jug. Use to refill our 12 oz squirt bottle, 16 oz spray bottle, or simply attach the included adjustable sprayer and squirt right out of the jug! Save $20 over single bottle prices! T Safe for use around pets. PredatorPee® Mt. Lion Pee Brand Mountain Lion Urine puts you in control of a pest animal’s natural predator/prey survival instincts and turns them into an all-natural repellent for you to prevent damage to your yard, garden, home, barn, shed, garage, crops, plants, trees and shrubs as well as cars, trucks, campers, RV’s and other vehicles and power equipment. Or if you need to protect your pets or livestock, our PredatorPee® Mt. Lion Pee Brand Mountain Lion Urine captures the unique marking scent of the mountain lion, panther, and cougar. These pests are the mountain lion’s primary prey: javelina, wild boar, armadillos, feral hogs, collared peccaries, saino, and feral pigs. When these critters smell the urine of a mountain lion in the area, they move out fast! So, if any of these pests are your problem, PredatorPee® Mt. 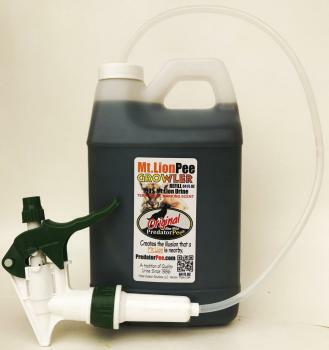 Lion Pee Brand Mountain Lion Urine is the natural deterrent you need. PredatorPee® - bringing Pee to the People for over 30 years!